Wisdom Panel DNA Test - we ask the experts! What’s your name and role in the business? 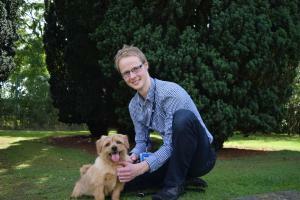 My name is Oliver Forman, and I am the Genetics Research Manager in the UK. My role is to coordinate research to enable continued development of our products and services. I joined Mars Veterinary in 2016 after spending 13 years researching inherited diseases in dogs, discovering disease causing mutations, and developing new DNA tests. Why would I use Wisdom Panel? Wisdom Panel is a great way to learn more about your dog. Visual identification of breeds within a mixed breed is actually really low, so a much more accurate way to find out is to use a Wisdom Panel DNA test. The easy to follow HTML report customers will receive is full of interesting detail about their dog’s breed make-up and provides a detailed family tree all the way back to the great-grandparent level. How does Wisdom Panel work? Testing your dog with Wisdom Panel swab tests begins when you use the cheek swabs to collect a DNA sample from inside your dog’s cheek and then send the swabs into the laboratory. The DNA is then extracted, and examined for the 1800 markers that are used in the test. The results of these markers are sent to a computer that evaluates them using an algorithm designed to consider all of the pedigree trees that are possible in the last three generations for your dog. Our computer algorithm uses information from our extensive breed database of over 13,000 dogs to analyse these potential pedigrees and determine which one is the best fit. Can Wisdom Panel certify a purebred dog? Whilst the Wisdom Panel tests can be used to determine how similar or dissimilar your dog is genetically to the other known purebreds of the same breed that we have in our database, Wisdom Panel testing is not intended for use in breed certification. Purebred certification is defined and governed by The Kennel Club. How accurate is Wisdom Panel? Genetic markers: These are the places of variation in a dog's DNA. By studying both the similarities and differences in these markers among different breeds, we are able to determine characteristic signatures. During Wisdom Panel test development we completed over 19 million genetic marker analyses and typed over 13,000 dogs. This is important because careful analysis is needed in order to accurately locate the sites of variation that make each breed unique. All of these calculations require a very advanced computer program that can analyse all of this data and identify the breeds in each dog. Today we use 1800 markers for testing. Numbers and types of dogs: Our database is used to compare your dog's DNA against other dog’s DNA. The more breeds, the better the test. The Wisdom Panel 2.0 tests cover over 185 different breeds, types, and varieties. Validation testing for accuracy: This includes repeated testing of a dog’s sample and review by independent third party specialists, geneticists, and leading authorities on canine genetics. All of the Wisdom Panel tests are run in an USDA-accredited laboratory to ensure proper quality control. Can Wisdom Panel be used on dogs of any age? Yes, however, we do recommend waiting until a puppy has been weaned to prevent cross-contamination from suckling on their mother and having cells from her skin and milk in their mouth at the time of swabbing. Can dogs eat/drink before being swabbed? As food particle can impact the quality of a DNA sample, there needs to be a delay of approximately two hours after feeding a meal or treat before beginning swabbing. No sampling delay is needed after a dog drinks water. Does Wisdom Panel provide proof of parentage? Wisdom Panel tests also do not provide parentage testing or proof of parentage at this time. When air-drying the swab, can it become contaminated? Once the sample has been received at the lab it generally takes two to three weeks for the sample to be tested, the results generated, and the report made available for viewing. You will receive an email notification when your report is ready.